Aunt Nan Peep had some fun with a photo of me! I have Skyler’s octopus, my special Happie Blankie, and am enjoying rainy day snooze! Here’s hoping you’re having a nice snoozy day where YOU are. Thank you Auntie June, Bacon & Houdini ! We so miss our Stuart, but the Pepstress keeps I glorious photos. Happy Birthday tomorrow (3/15) deal one. You are so missed! I love a good pawty. Stuart did, too. March 15 marks his 11th birthday. (In spirit.) So, let’s celebrate the boy. How’s that sound? Here are 11 images of Mr. Stu. The soul who still lives among us. The Stumeister who lived life at his own pace. He lived large. Reblog, tweet and retweet his birthday post – scheduled for midnight – and let’s start celebrating. Leave a comment and share your memories. Woot! Oh…and let’s say NO to hemangio – the dreadful cancer that took his life and so many others. For every comment, reblog, tweet or retweet on Stuart’s birthday, the Dad Peep and I will donate a buck to Stuart’s Fund. Now THAT’S a pawty! Rock on Studebaker Boy! Oh yes it did……I GOT OUT! Yes friends and neighbors, I got out. I sprang through a crack in the door, and was merrily on my way. Mama was expecting a Shredder out of Raleigh (about an hour away), and was trying to get the stuff that needed shredding on the porch. She thought I was far enough away…BUT I WASN’T and I sprang out the door. Mama grabbed her phone and texted my next door Auntie Michelle that I was out and in her yard. But hah hah, I got outta there really fast and in spite of their best efforts, I eluded them. Then the Shredding Truck shows up. Mama says to the driver, “My dog just got out, here’s your check and here’s what needs to be shredded….I have to go.” Shredding man says “Oh no! Yes, go after your dog”. By now, Auntie Michelle had called our other neighbor Auntie Laurie, who adopts any dog or cat that no one else will (we all live next door to one another, kind of like the Bermuda Triangle of animal rescue) , and she was on the case….the three of them had tracked Aunt Lauries’ senior dog Hampton about two years ago in the freezing cold (and Auntie Michelle found him!) So Mama raced over to Aunt Laurie, who had her car in gear…they started driving and looking and calling for me. Mama was just smacking herself over and over again….Aunt Laurie was trying to soothe Mama…and then, Auntie Michelle texted….she had me! Mama and Aunt Laurie careened around the curve….and there we were….Auntie Michelle had me by the collar and she wasn’t letting go! Happy ending, right….WRONG! Yes, happy to get me back, but when we got home, Mama got me wiped down, gave me treats, and started looking for her 2016 bank statements. HAHA HAHA they had been shredded! Well that was IT for Mama. She drove to the bank, made the Rescue Happie Blankie/Tug deposit and broke down. The Branch Manager tried to comfort her, but Mama had had it for the day. She ordered copies of her checks, dragged herself back into the car, drove home and told me that it was going to be an early evening. And it was. I woke Mama up at 5AM to throw up what I had enjoyed on my romp, and when we came downstairs later this morning, the Mater found several “presents” that I had left downstairs. She thanked me for at least leaving them downstairs, fixed my breakfast and took me next door to play. I think she went back upstairs and crashed and burned. But she denies this. Anyway, I have been extra nice to Mama today…but who knows about tomorrow? Skyler here. As Mama had posted earlier, she had to unexpectedly buy me a ticket to the Bridge at the end of December. Shortly thereafter, she learned of a 17 month old female, who needed to find a home quickly. Mama applied, and was accepted. And that’s the Readers Digest Condensed. Remember, I am always watching over Mama, now Fiona has the paws on duty. So here’s Fiona! It was a bright, sunny day. I drove for about two hours, and met Mama and her friend, my new Aunt, Karen. Mama signed some papers, handed over a check, got my toys and food, put me in her car, and off we went. I cried the entire two hours. They tried to comfort me, but no luck. Every once in a while, I would take a break, and they would relax, but pretty soon I would start up again. Finally we arrived at my new home, and I ran inside. There were toys, balls, beds, and blankets. Looked like a pretty good set up. I explored, and decided to stay. So now here I am, protecting Mama, and continuing Brother’s work in Rescue, by helping Mama sell Happie Blankies & Happie Tugs to help other homeless dogs. And, Mama made me a Facebook page, Fearless Fiona if you want to follow me there. I think that’s all for now…I will be back. Nice to meet you ! 1.No big secret there…..Mama makes me happy, cause we’re a team, just like peas and carrots. 2. Selling Happie Blankets (like the one I am sitting on). We have all kinds of designs, they are fun to sell, and we are helping homeless dogs. As a rescue guy myself, that means a lot. And when we sell a blanket, we get VERY HAPPY! 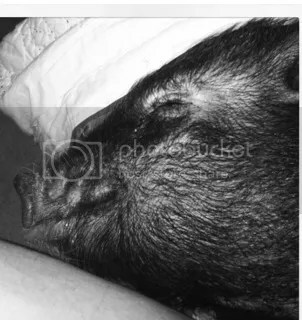 When we hear how much our customer loves their blanket, we get very happy, and if they send a photo, we get moist eyes (mainly Mama). We have a goal of selling a blanket in all 50 states. So far we are in 14….only 36 to go! When we make our goal of 36, we will not only be happy, we will be OVER THE TOP HAPPY ! 3. Riding in the car. I love to ride in the car and can’t wait for the temps to go down, so I can resume going most everywhere with Mama. 4. Going for my monthly groom. I love my Groomer, and, I get to play with The Fab Four, 4 other Scottie pals. Plus, I get to see my Auntie Karen who has to be my #1 fan. The woman is crazy about me I tell you. Ashley our Groomer lets us run around and play in a big, gated area the entire time (except when we are being bathed or clipped) Then we become The Frisky Five and we are all zonked out by the time our Mama’s come to pick us up. 5. All of my new friends. For a guy whose previous owner turned him in, I think my life has gone from zero to 60 in no time flat. I love reading about my friends and their adventures. I love making new friends. And when I get their responses on my blog…well, it all makes me happy. Remember those immortal words….Don’t Worry, Be Happy! The Purposeful Life Becomes More Rewarding! Greetings from the Fulfillment / Quality Control Department of Happie Blankies, Scottie Division! I am happy to tell you that quite a few pups and their Hoomans have jumped on the Help Homeless Dogs Train. 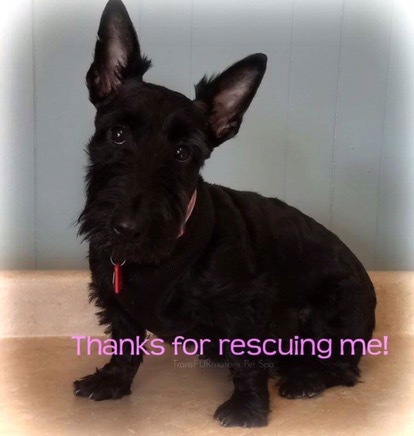 Case in point – Meet Carson from the North Texas Scottie Rescue. Carson prefers the back of his blanket ( he selected our classic grey Scotties on a red background, with a grey plaid back). His Hooman reports that it is hard to get Carson off his blanket. But I digress. Carson and his Hooman chime in regularly to Testify as to how much Carson loves this blanket. You can’t make this stuff up..
And do meet Franky….Franky and that one of a kind Flamingo blanket are like peas and carrots. Here is where the magic happens! After our customers have selected their blankets, we wrap them in tissue, tuck in some information about the blankets and what the proceeds are used for, and head to the Post Office! Here we are, deep in the heart of our Operations/Quality Control Center……I am hard at work as you can see. Mama has to do the tissue, the notes, and the PO Priority Mail prep, but hey……she needs to feel useful…..
New designs arrive weekly, so we try to keep everypawdy and their Peeps informed. If you wonder why you haven’t been invited over for dinner, you can clearly see that the dining room has been repurposed. That’s all for now! Mama and I want to thank everyone who has helped us help homeless dogs…you know who you are, and YOU ROCK ! Keep sending us your photos and your testimony. And Car Dog, Sky Man says a special thank you for jumping in at every opportunity you get to spread the word. Arooooo!